at 6:30 -7:30pm at 5941 Hollywood Blvd. This is a nice indoor facility, a sit down dinner. Get in the line that forms. It gets dark early so bring a flashlight. There are no tables or chairs allowed, per the City of Los Angeles, who always has plenty of cops around to watch your every move. You will have to sit on a curb or sidewalk to eat. Clean up after yourself and pick up your trash. Bring some wet wipes with you in your back pack. If you ride your bike, watch it closely. You can park on La Brea I think after 7pm, but watch all the parking signs, many of the side streets have no parking after 6pm without a permit. Dinner is served here, 5941 Hollywood Blvd., Walk in the driveway and kitchen is just to the right. At this time it is served Monday through Friday only. Saturday and Sunday is still back at the corner of Sycamore and Romaine (The Line) at 5pm. 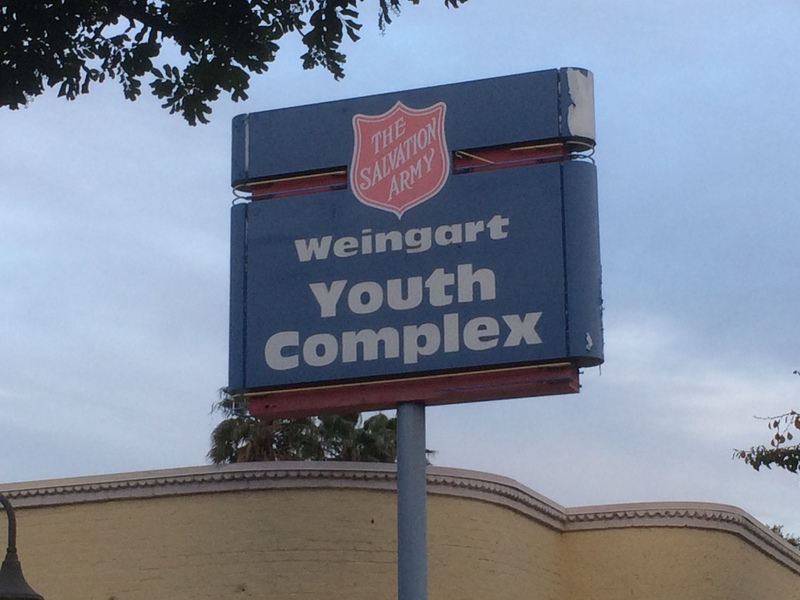 The new location for the Greater West Hollywood Food Coalition is inside the Salvation Army Weingart Center. Tables and chairs, restroom to wash up. Please thank the wonderful staff and volunteers of the Coalition for all their great work. This Fall the Greater West Hollywood Food Coalition Will Be Moving the Food Distribution to the Salvation Army ! Finally, Indoor Seating, Bathrooms, Dignity! Great News! 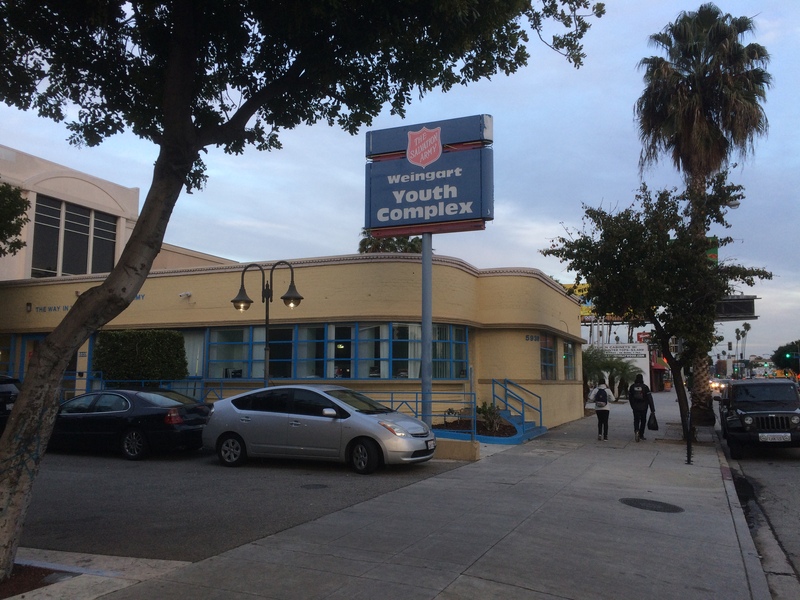 Sometime in late October or early November, the Greater West Hollywood Food Coalition will be moving it’s operation to the Salvation Army building in Hollywood at 5939 Hollywood Blvd., near Bronson. 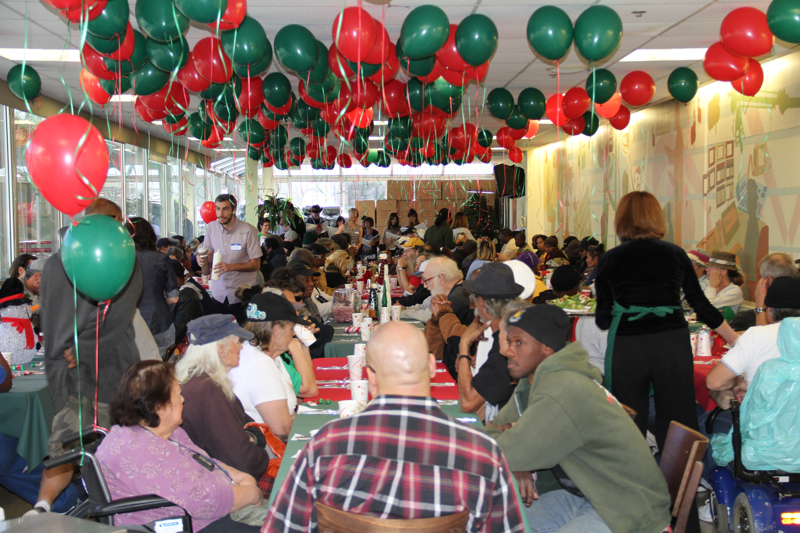 The Salvation Army has generously given the GWHFC the use of their kitchen and dining room. Hooray! Homeless folks and others who depend on the nightly hot meal can now have a place to sit down at a table in a clean environment and enjoy a nice meal and chat with friends, just like the rest of humanity. 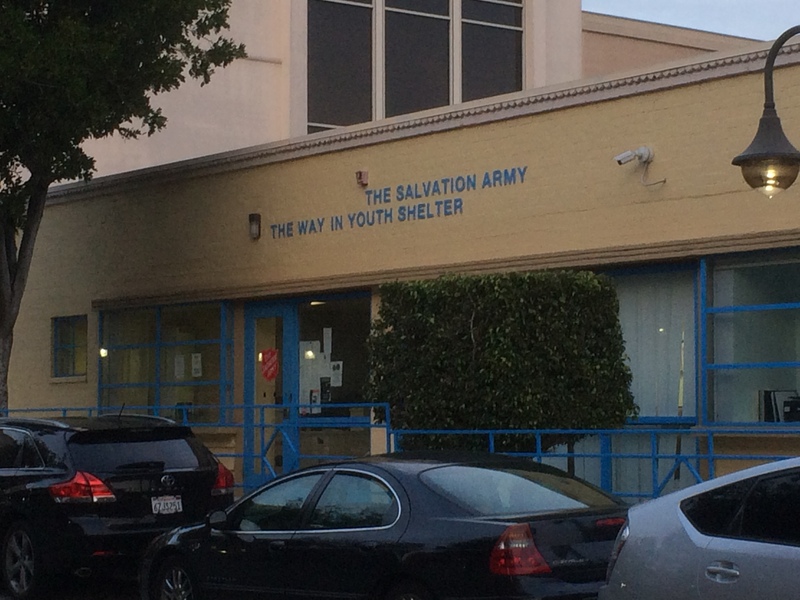 The GWHFC will be in charge, thanks to the great folks at the Salvation Army Hollywood. “The Line” at Sycamore and Romaine served a purpose for years, as it was the only place to serve food. But it had its drawbacks: no seating, no tables, no bathrooms. Just a dirty sidewalk to sit on. It will be so nice to be indoors, out of the rain in the winter, in a place where you can wash up in a bathroom, and be treated like a human being. So three cheers for the Salvation Army for inviting the Food Coalition to use their facility with no strings attached! And three cheers for Sheri and the great folks at the GWHFC who work so hard every day of the week to provide food for the needy, seniors, homeless, and others! This is a well-deserved move and one that will benefit all parties concerned. Every night between 6:15 and 7:30 a community comes together at the barren street corner of Sycamore and Romaine, along the border of Hollywood and West Hollywood. On the one hand – on one side of the table – are the volunteers of The Greater West Hollywood Food Coalition, a broad-based grass-roots organization which for the past 25 years has served a hot, fresh, and nutritious meal every night to the homeless and hungry. On the other hand are between 150 and 200 men and women who have somehow or other fallen through the cracks, and for whom the meal they are about to eat, sumptuous as it is, might well be the only meal they have all day. The GWHFC is comprised of actors, producers, writers, artists, teachers, journalists, lawyers, housewives, and a corps of former “clients” who have all had a strong desire to give back by volunteering in Los Angeles. Serving a meal to the “homeless and hungry” is the smallest part of what we do. We meet them on their own turf, talk to them, and listen. We get to know them as individuals, and, little by little, in all kinds of ways, we then help them to think better of themselves and to not be shy about asking for specific, practical help – which the Greater West Hollywood Food Coalition, entirely unsystematically, then tries to provide. All together, volunteers and homeless, form a kind of microcosm of what the larger community ought to be, but now, in the big city, is no longer. The motto of the GWHFC is simply this (with no religious strings attached): I Am My Brother’s Keeper. Slab City in danger of sale by Jerry Brown. State owns millions of acres but wants to sell the only place where folks live FREE. Stay tuned for developing story. SF. Follow us on Twitter - @gypsy_cool. Check out latest information of Skip's 3 books, The Trilogy on Practical Living. Click on "Books for Gypsies" on top menu. Links to purchase books are on the page now.